A change of location, this is under the Basilica Dei Santi Cosma E Damiano, situated right in the centre of ancient Rome. The Franciscan Monk who takes care of the church and cloister gave me a guided tour and gave me access to the otherwise closed lower basilica. Besides all this underground painting, I have also been visiting lots of above ground places, lots of churches but also other academies. Most recently the American, where a few of us ( artists from BSR ) had lunch and visited studios, staying on for an inspiring talk by Yves-Alain Bois on Elsworth Kelly’s 65 -year long dialogue with Architecture. 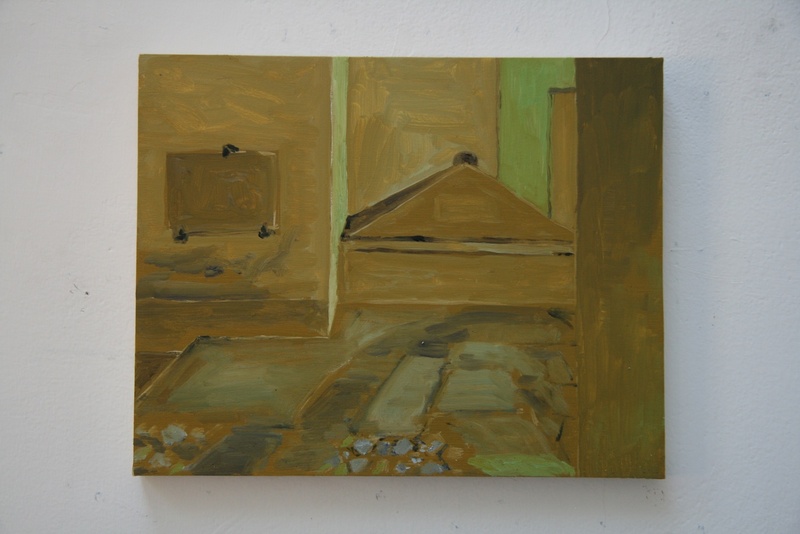 And it was great to re meet up with Amy Sillman, a New York painter who I met over twenty years ago, also in Rome on a fellowship….plans to meet up and do more catching up. Thats Great! i remember looking at Amy Sillmans work earlier this year somewhere – i’m a bit of a fan…Did she have a show here in London or something? I kept on meaning to mention her to you as i was sure you would like her work. What a coincidence.